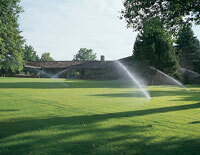 Butler Irrigation Inc. has been locally owned & operated since 1975. M ike Radwanski and his wife Gayle Radwanski are President and Vice President respectively. We are proud to serve Northeast Florida including Fleming Island and Jacksonville, solving our customers irrigation needs and providing the highest quality sprinklers and systems. Mike entered the irrigation industry first as a well driller in 1980 in southwest Florida, then in 1981 crossed over to the irrigation division with Youngquist Brothers, Inc. in Fort Myers, FL. Later in 1981, he was offered a job with the competition McGregor Pump Company, with positions in sprinkle installation foreman, and sprinkler and pump service until moving to the Jacksonville area in 1984. Joining the Butler Irrigation Team in 1984 duties were assisting then owner C.B. Butler, with daily operations in installation & sales as well as company foreman. After helping the company grow we were offered purchase of the company from owners Billy & Shirley Butler in 1990 after their retirement. We strive to offer the best Lawn Sprinkler Sales and Installation, as well as Landscape Lighting Sales and Installation. Service in both departments is also offered. "OUR QUALITY LASTS A LIFETIME" is our proud company motto, by offering the utmost quality with commercial grade products from various manufacturers. This allows us to provide 2 year warranties on Residential Sprinkler Systems and 5 year warranties on Commercial Systems with similar warranties on our Landscape Lighting Products & Services. Our employees have years of experience with continuing education in both departments to employ sound and quality practices to provide you with years of enjoyment with minimal or no costs to our customers. All of our products are manufactured to last 20 to 25 years of continuous service.